Drawing influence from Moroccan and Balinese design elements, the villa interiors blend deeply soothing soft natural hues with rich décor featuring traditional Thai teak wood, rattan and silk, to perfectly complement the natural beauty of the lush jungle settings. 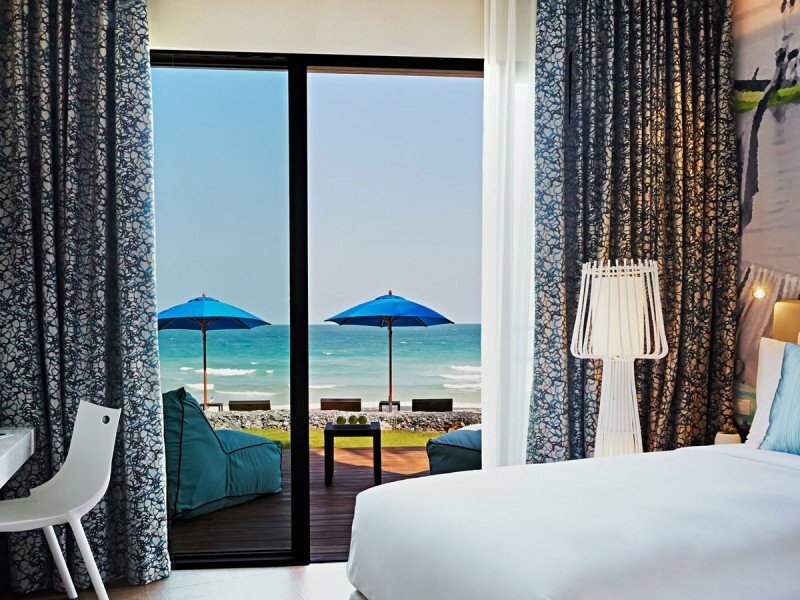 Wake up refreshed in a luxurious four-poster bed with stunning tropical garden or beach views through near floor to ceiling windows. Rejuvenate in the spacious bathrooms that feature oversized plunge bathtub, modern vanity and separate outdoor walk in rain shower. Take time for yourself in the shady interiors of the spacious and comfortable seating areas. Each villa offers superb private outdoor living space with generous private terraces, comfortable sun loungers for deep relaxation and a Sala for outdoor dining. Most villas have the added exclusivity of a luxurious private infinity-edged pool with Jacuzzi. Situated in tropical gardens that gently cascade down the hillside to the pristine white sand shores, each of the 40 villas has steep thatched roof design with high vaulted ceilings to provide over 100 Sqm of luxurious living space. 100sqm Each of our 4 Garden Villas has an elevated jungle setting with extensive private terrace just perfect for stretching out and relaxing in the sun. A Sala with table and chairs offers a romantic tree top setting for private outdoor dining, while a calming blend of design elements in the living space ensure an exclusive getaway in harmony with the natural beauty of the surroundings. 100sqm The luxurious private living space of these 6 Garden Villas has the added feature of a shared pool for the exclusive use of guests in these cluster villas. The tranquil atmosphere of the tropical garden setting is just perfect for those looking to spend time together in a more secluded paradise getaway. 100sqm Experience luxury outdoor living in each of our 16 Garden Pool Villas, ideal for couples and honeymooners seeking an exclusive romantic escape. Relax on comfortable sun loungers in the tropical surroundings of your spacious wooden terrace. Take a dip in your own private infinity-edged pool with Jacuzzi, or share a romantic dinner in the Sala. 100sqm With the beach on your doorstep, each of our 13 Beach Front Villas offer spacious terraces opening out on to uninterrupted views of the pristine white sands. Featuring your own private infinity-edged pool and Sala for outdoor dining, you need not venture far from the villa for an exclusive paradise beach escape. butler, this is the ultimate exclusive island retreat for discerning guests.